Former lawyer and the current Minister of External Affairs of India, Sushma Swaraj is an Indian politician and a leader of the Bharatiya Janata Party. She is the second woman to be India's Minister of External Affairs, after Indira Gandhi. She has been elected seven times as a Member of Parliament and three times as a Member of the Legislative Assembly. At the age of 25 in 1977, she became the youngest cabinet minister of north Indian state of Haryana. She also served as 5th Chief Minister of Delhi, for a brief term in 1998. Ganesha here tries to analyze her performance as the Union External Affairs Minister in the forthcoming year. Jupiter will be transiting over her Natal Ketu in Leo, and it will be aspecting her Natal Venus in Sagittarius, it will also be aspecting her Natal Sun and Rahu in Aquarius, till 11th August 2016 in her Solar Chart. Transiting Saturn will be aspecting her Natal Mercury in Capricorn, it will also be aspecting her Natal Ketu, till January, 2017. Rahu will be transiting over her Ketu for one and half years. Ketu will be transiting over the Planets of her Sign during the same period in her chart. Sushma Swaraj will be under the mixed influences of transiting Jupiter, Saturn, Rahu-Ketu. She would succeed in controlling the trouble-creating activities of her opponents to some extent and avoid the obstacles placed by them in the system of working of her ministry of external affairs. The stars indicate that transiting Ketu may provoke her to commit mistakes to create controversy while dealing with the matters related to her ministry during the year ahead. She will have to be cautious and protect her image and popularity. She will have to be attentive while making important statements in the media/public during the year ahead. Sushma may face various challenges beyond January, 2017 also, because the transit of Ketu may give her excessively stressful atmosphere. This may effect her popularity and image as a reputed minister of the cabinet. In addition to this, transiting Saturn may give difficulties and problems due to which she may lose her temper often. She may delay the decisions related to important and immediate mattes which are required to be taken within deadlines. However, the transit of Jupiter will be providing her due protection and save her from committing big blunders or taking unwise decisions in important ministerial matters, till 11th August, 2016. Her performance as senior leader will be good even while facing various challenges till 11th August, 2016. She would be out of the protective radar of Jupiter and the negativity of transiting Rahu, Ketu and Saturn will keep on giving problems post above period. 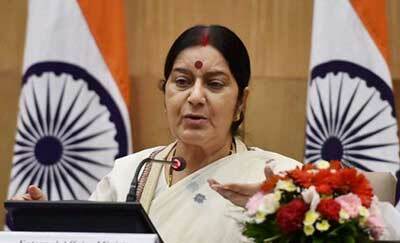 Sushma Swaraj will have to make her political proficiency more active during the year to have desired results. She may expect due rewards for her efficient and excellent work as a minister. She may succeed in improving the political relations with the neighboring countries of India. She would be in a position to put forward remarkable and noticeable work to the desired level, during the year ahead for her ministry. Sushma Swaraj, may come out as one of the good female ministers of the cabinet during the year ahead, feels Ganesha. Ganesha wishes good luck and a bright future to Sushma Swaraj.